Daily Illuminator: Send In The Clowns! December 3, 2017: Send In The Clowns! Run, the clowns are here! Well, you should run to your nearest game store and preorder Munchkin Clowns! With sinister painted-face monsters and circus-themed gear, this 15-card mini-expansion will bring extra creepiness to your game, because who really has enough madness and mayhem in their Munchkin games? Munchkin Czar Andrew Hackard developed these cards, so you know they're hilarious, and Len Peralta (Munchkin The Guild, Star Munchkin Guest Artist Edition) illustrated them, to bring you the eeriest clowns possible! 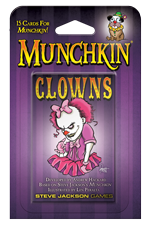 Munchkin Clowns will add the scariest part of the circus to your Munchkin deck. If any of your friends have coulrophobia, rest assured that this will work to your advantage. With these cards, you can wear your Big Red Shoes and Big Red Nose for big bonuses, and make a joke out of every Monster that comes your way when you Kick Down the Door. This mini-expansion is coming to your FLGS, or online at Warehouse 23, in February 2018! Just don't look into sewer drains marked with cheerful red balloons, you won't find it there . . .